Bill Neubauer, Co-Chair of the U.S.-Mexico Commission’s Health Services Committee, presents Ed Curry with the 2011 Healthy Farms Recognition for Curry Farms. 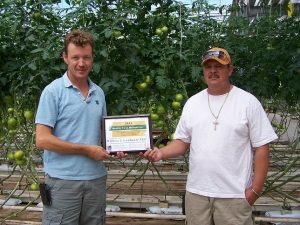 Two Arizona farms were recently recognized for being “Healthy Farms” by the Arizona-Mexico Commission. As of summer 2011, the Arizona-Mexico Commission has begun publically recognizing farms that meet high standards for health, safety, and sanitation and collaborate with a local Community Health Center to bring health outreach services and basic health education to workers. 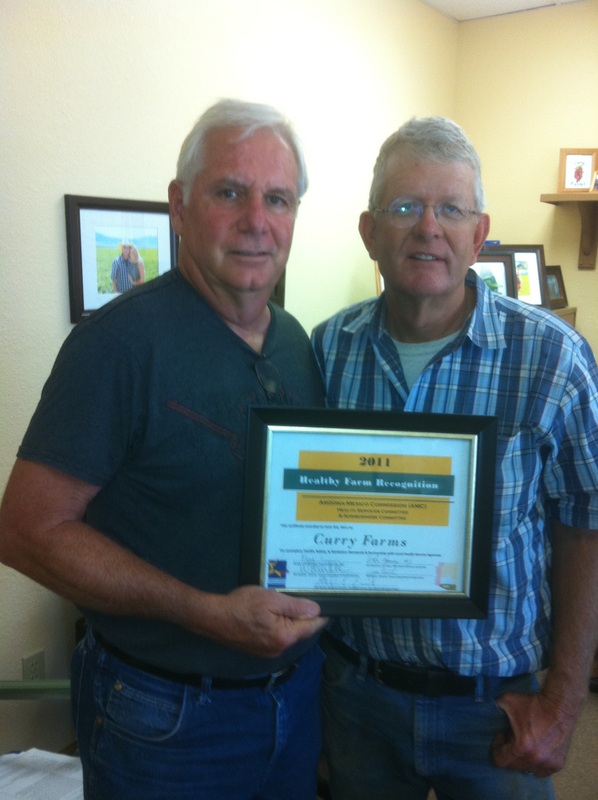 We are delighted to announce that Curry Farms and Willcox Greenhouses in Cochise County have been selected to receive the Healthy Farms Recognition. And eventually, one to two employees from each site will participate in trainings to become “promotores de salud,” (community health workers) qualified to do health education, provide referrals and be a bridge to services, and be a consistent on-site resource for health and safety issues among their peers. Healthy Farms began as a collaboration between CCHCI, the Southeast Arizona Area Health Education Center, and the Arizona-Mexico Commission as an innovative response to addressing the barriers farmworkers often face to accessing quality health services and health information. These obstacles include issues such as lack of transportation, long work hours that conflict with clinic schedules, cultural and language barriers, lack of insurance and limited knowledge of existing local services and how to access them. At the same time, the Healthy Farms team understood that most growers do not have the capacity to meet these needs on their own, and that listening and responding to growers’ needs as well would lead to the most productive and valuable partnership. Ed Curry of Curry Farms has described Healthy Farms as “a win-win situation for growers and farmworkers” because recognition ensures the quality and sanitation standards of the product as well as supporting workers’ health, and brings positive attention to the industry. Healthy Farms is currently developing models for store displays and labels to use the Healthy Farms Recognition as a marketing tool to attract consumers and increase sales. In recent years there has been growing interest among consumers in traceability and local produce, as well as knowing more about the conditions and environment in which food is grown and processed. Healthy Farms labeling has a strong potential to tap into that market. Willem Doelman, Grower, and Juan Rodriguez, Packing Manager, receiving the Healthy Farm Recognition for Willcox Greenhouse LLC. The Arizona-Mexico Commission is endorsed by the Governors of both Arizona and Sonora, Mexico, and the Healthy Farms certificate includes signatures from the directors of the Arizona Department of Health & Human Services and the Arizona Department of Agriculture. Criteria assessed during the site visit included standards in hygiene and sanitation, personal protective equipment, heat and sun safety, pesticides and chemical safety, and emergency preparedness and first aid. Healthy Farms provides access to health services through the CCHC outreach team , health education workshops, and referrals to needed services. As a pilot project, Healthy Farms is currently operating only in Cochise County, with the intention of expanding to other agricultural areas of the state in the near future. If you are interested in participating, or for more information, please contact Hannah Hafter, Program Coordinator at the Southeast Arizona Area Health Education Center (SEAHEC) at hhafter@seahec.org or 520-287-4722. This entry was posted in Arizona farmers and ranchers, In the News and tagged American Farm Bureau Federation, Arizona, Arizona farmers, Arizona-Mexico Commission, Health, Ranch, United States, United States Department of Agriculture. Bookmark the permalink.